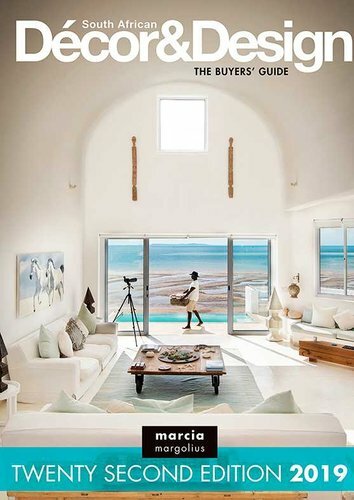 Welcome to the 2019 edition of The Buyers' Guide. With 22 years of publishing this guide under their belts, South African Decor & Design are equally proud of all that has been and excited about all that is still to come. The Guide has grown progressively over the years with the recent launch of their new website, the establishment of their digital platforms, and the ever-popular blog ‘Marcia Loves It’ collectively facilitating positive change through innovation and creativity. Once again they have compiled a remarkable directory of over 3 000 key industry players, home décor specialists, interior designers, architects and lifestyle brands. The Guide continues to facilitate networks between industry players and provide inspiration and valuable information to all our readers. As well as offering the latest trend inspiration, newest product collections and optimal brands, they also strive to be at the forefront of international exhibitions, events and shows, while embracing the rise of the social and digital spheres. The choice of cover this year was inspired by all that is good about living in South Africa. We so often forget about the beauty of the country and are so inundated daily by all the negatives that go with living here that South African Decor & Design wanted to create a shout out for all the reasons why we do live here. COMPETITION: When buying this book, inside you'll find details on how to enter and stand the chance to win a Bed and Bath makeover worth R 70,000.00, including sumptuous bedding from Sealy and bathroomware from Duravit.